What if you were suddenly faced with the now-or-never chance to leave your spouse for your lover, no messy strings attached? Would you take it? 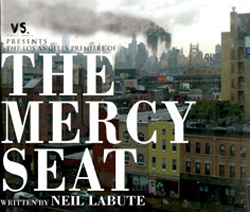 Michelle Clunie (Queer as Folk) and Vs. Theatre Company artistic director Johnny Clark star in the Los Angeles premiere of The Mercy Seat, Neil LaBute's caustically funny examination of opportunism in the wake of tragedy. Ron Klier directs a six-week run, opening March 19 at [Inside] the Ford. Pay-what-you-can previews take place on March 17 and 18. Set on September 12, 2001, less than twenty-four hours after terrorists brought down the World Trade Center, The Mercy Seat introduces us to lovers Ben and Abby. Ben was supposed to have been working in the Twin Towers on that fateful day, but was playing hooky with Abby, his mistress and boss. Suddenly the two see a new possibility for their future that didn't exist just a day earlier. Will Ben let his family know he's alive? "Although set against the backdrop of September 11, the play is timeless - a testament to the mess love can make of our lives," explains Klier. "Even in a time of national tragedy, life goes on. We proceed, preoccupied first and foremost with ourselves, with our needs and wants." "I am trying to examine the 'ground zero' of our lives...the painful, simplistic warfare we often wage on the hearts of those we profess to love," wrote LaBute in his introduction. The Mercy Seat premiered at New York's Manhattan Class Company in 2002, directed by LaBute and starring Liev Schreiber and Sigourney Weaver. Newsday called it, "uncomfortable yet fascinating... provocative... sharp, compelling and more than a little chilling," while Timeout found it to be "sharply funny and incisive." In The New York Times, Ben Brantley compared The Mercy Seat to Strindberg's Dance of Death and Edward Albee's Who's Afraid of Virginia Woolf? "in which men and women lock in vicious sexual combat." Recently named "one of the top theater companies of the last decade" by the LA Weekly, Vs. Theatre Company strives to produce thought-provoking theater that simultaneously challenges and entertains its audience. Focusing on Los Angeles premieres, Vs. has produced or co-produced major contemporary playwrights including John Patrick Shanley, Stephen Adly Guirgis, John Kolvenbach, and Adam Rapp among others. Vs.' co-production of In Arabia We'd All Be Kings with The Elephant Theatre Company was named Best Production by the Los Angeles Drama Critics Circle in 2008. Vs.' follow up production, On An Average Day, which was produced in Los Angeles and Chicago, received Critic's Choice in both the Los Angeles Times and the Chicago Tribune. It won or was nominated for several awards and is slated for an off-Broadway run in Fall, 2011. The Mercy Seat is the third and final production in the 2010-11 Season at [Inside] the Ford, a three-play, curated series of new works from three L.A.-based theater companies that is supported by the Los Angeles County Arts Commission and the Ford Theatre Foundation, with funding from the National Endowment for the Arts. The Mercy Seat runs Wednesdays, Thursdays, Fridays and Saturdays at 8 pm and Sundays at 2 pm, March 19 through April 24. Two previews take place on Thursday, March 17 and Friday, March 18, both at 8 pm. General admission is $20; seniors and full-time students with ID are $12. Pay-what-you-can tickets are available for previews and all Wednesday evening performances when purchased at the door (subject to availability).